I don’t know about you, but I definitely prefer rich desserts over the sugary ones. The website lists all of their ingredients, none of which are phoney or scary artificial sounding. These cookies sound right up my alley. Check out their vision and they might win you over as well. This flavor would be my first pick, but I also like that they have an Intense Almond Golden Raisin Granola Cookie. Golden raisins are another fave of mine, but darker raisins are typically what people use, so these sound like a nice change of pace! Package design by Renaud Garnier. 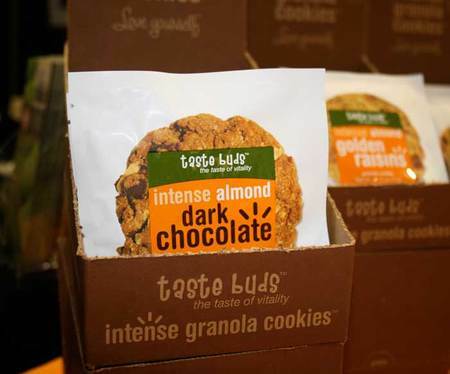 Buy yourself a box of Taste Bud’s Intense Valencia Peanut Milk Chocolate Granola Cookies at Amazon. The above photo is from The Dieline. Check out more tasty package design at their blog!